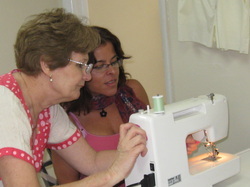 Sewing machine: Use and understanding parts of the machine to a full potential, practice must common stitches and control on sewing, practice Buttonholes, Zippers sewing.Maintenance and small services.Use Studio Sewing Machines or bring yours, (with the owner Manual). The price for this 2:30 hour Class is only $ 60.oo. Introduction to Fabrics : The knowledge of Fibers, Thread and Fabrics are the essentials to understand which material to choose for the perfect final garment. This class will set you in right path to achieve this goal. 2:30 hours Class for only $ 60.00.